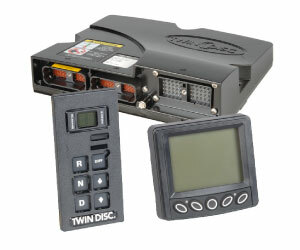 Discover advanced controls for smooth engagement with three Twin Disc electronic control systems. The TDEC-500,TDEC-050 and EC300-Engine & Clutch Control System give you microprocessor precision for total control over startup, acceleration and operating speed. Let us help you choose the right system to integrate the transmission, engine and other vehicle systems, with the flexibility to tailor options for optimum vehicle performance.